Once you've decided you need to upgrade from Windows 10 Home to Pro, you have two methods to do so. One is to do a fresh install of Pro, while the other is to install Pro on top of Windows 10 Home. We'll focus on this second method here because your computer likely came installed with Home. If you don't know which version of Windows you have, you can find it easily whether you're using Windows 10, 8, 7, Vista, or XP. However, if you installed Home manually, for example on a PC you built yourself, you have the option to move the Home license elsewhere and install the Pro version in its place. Our FAQ on product keys will tell you everything you need to know about moving Windows licenses between machines. First, make sure your PC doesn't have any pending updates. Next, select the Start Menu, then select Settings. 4. Select Activation on the left-hand menu. 5. Select Go to the Store. This will lead you to the Windows Store where you can purchase the upgrade by selecting the Buy button. 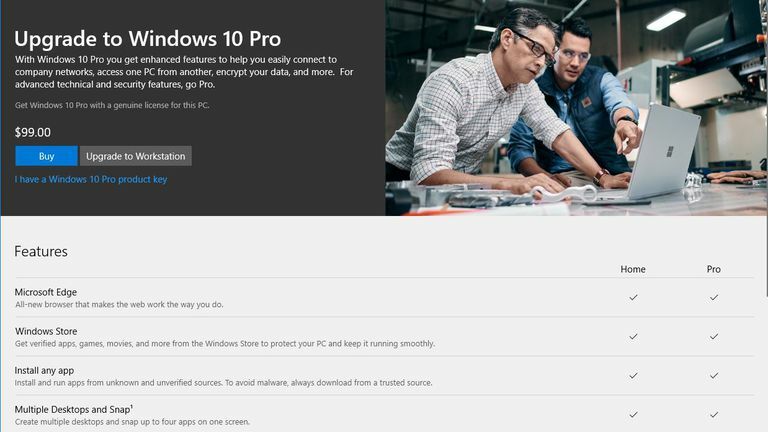 Upgrading to Windows 10 Pro will cost you $99. Log in with your Microsoft account, then enter your payment method. Windows will upgrade in no time flat. If you've received a full copy of Windows Pro instead of an upgrade copy, you should be able to move that Home license to a new machine. You can do this if you installed Home yourself, but not to a copy of Home that came pre-installed on your PC. When you buy a new PC, you typically get a cheaper copy of Windows than if you bought it at retail, but it's bound to that particular PC. Make sure you're up to date on any Windows Updates. Navigate again to Start Menu > Settings > Updates and Security > Activation. Under Activation, select Change product key. Enter the 25-digit Windows Pro Product Key. Select Next. If your key is correct, the upgrade will start, and you'll soon get a message that Windows has been upgraded. Look at the bottom of your Windows laptop, or on the top/side of a desktop tower. There might be a sticker there showing your original Windows product key; alternatively, it might be in the manuals and other material that came in your PC's box. Enter the key in the Change product key dialog as noted above, and you'll effectively "downgrade" to your old Home license. Your upgrade license should now be freed up to be installed on another machine. Try to do this while you're online, so Microsoft can register that you removed the Pro upgrade.